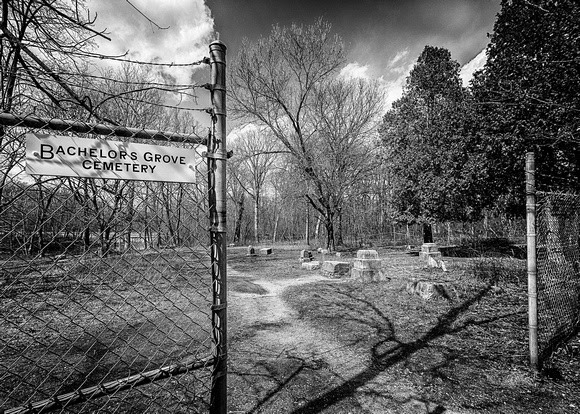 One afternoon in April, I visited Bachelor's Grove Cemetery. 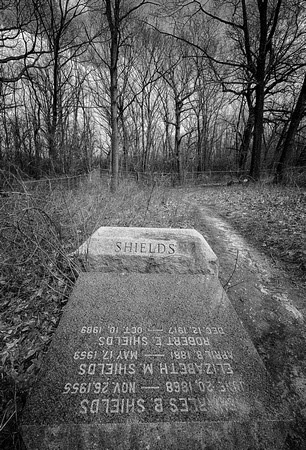 This is a very small graveyard located in the Cook County Forest Preserves just outside of Chicago. Visitors must walk through the woods to gain access to the grounds. 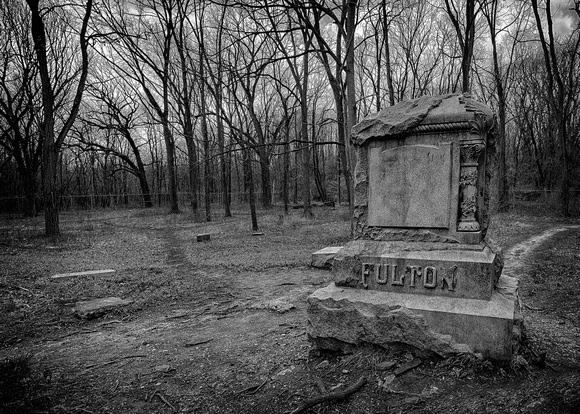 The cemetery has a reputation for being one of the most haunted sites in Chicagoland. "Ghost hunters" from around the country come to visit the graveyard. 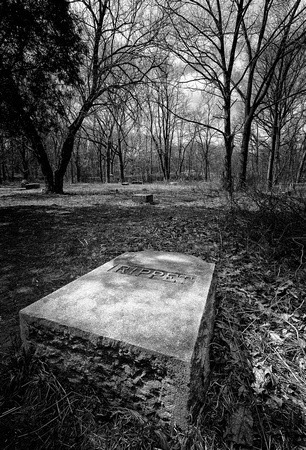 Click here to visit a website that contains more information about the history of the cemetery. I visited the site in hopes of capturing some photographs that would document this legendary location that is so close to my home. Sadly, the cemetery has been desecrated. During my visit, a woman who entered the cemetery tried to convince me that she was experiencing paranormal activity. She told me that her camera had burned through three sets of batteries while she was shooting photos during her stroll to the cemetery. I told her that I had been shooting for 90 minutes on the grounds without any battery issues. I had to wonder why she would have brought so many batteries to a site which requires only a five minute walk from the parking lot. The fact is that most people visiting the graveyard come convinced that they will experience something extraordinary--so they do! I also met a man at the cemetery who was removing trash. I ended up talking with him for fifteen minutes or so. He was very familiar with the grounds, having lived near the cemetery since the early 1960's. He told me a lot about the history of the site. He talked about how beautiful the grounds were many years ago; how families visited the cemetery and had picnics near the grounds; and how he swam in the pond next to the cemetery when he was a boy. He also talked about how the cemetery became more remote when a local road closed and how the isolated cemetery shortly became overrun by vandals. Over the years, vandals dug up graves and toppled and destroyed most monuments. Even the cemetery sign is constantly stolen. In part, the lack of respect that these vandals showed at the burial grounds led to the creation of many of these ghost stories. While many local residents are convinced that the grounds are haunted, the groundskeeper that I talked with said that he hadn't seen a single event out of the ordinary in over 45 years--and he's visited the grounds on most of days over that span of years. One of the biggest challenges from a photography perspective is that there isn't much left at the site. Most of the stones have been stolen. The original sign which arched over the entrance is long gone. There's just a handful of broken tombstones laying in the dirt and weeds. Rather than finding myself frightened or fascinated during my visit to this legendary cemetery, I found myself angry at the vandals who showed such little respect to the departed and sad for the families who buried loved ones at the grounds. The groundskeeper told me about a 90 year old woman from Wisconsin who recently came to the cemetery to pay what she thought would be her last visit to her departed sister's gravesite. I can only imagine what she thought when she entered this graveyard.